Air rifle HATSAN BT65SB-ELITE 4.5mm. Air rifle HATSAN BT65SB-ELITE 4.5 mm. Muzzle velocity - 380 m / sec. 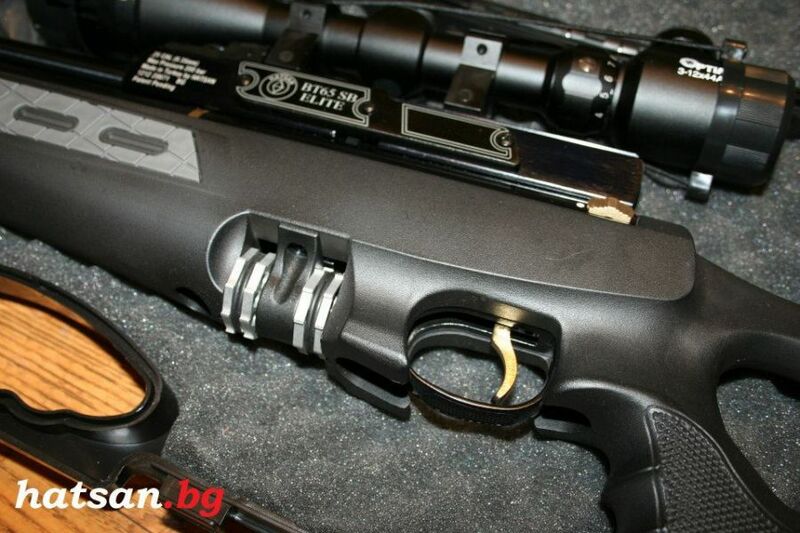 Air rifle HATSAN BT65SB-ELITE 4.5 mm. is 10-shot, manual loading, side bolt action, pre-charged pneumatic (PCP) air rifle.Precision rifled choked barrel for accuracy, threaded for ½” UNF sound moderator & fitted muzzle cap. Manual side load. The stock is ergonomic, synthetic, adjustable, with finger hole and mounted rail for attaching accessories, lasers, flashlights. HATSAN BT65SB-ELITE has Built-in pressure gauge on the air cylinder to monitor the cylinder pressure. Anti-double pellet feed - system to prevent from falling more than one pelles in the barrel. Quattro Trigger - two stage metal-plated trigger. Air Rifle HATSAN BT65SB-ELITE 4.5 has patented antishock system. Tire for optics 11mm/22mm. Adjustable front and rear sight with Truglo fiber optics. Packed in its hard case with a sling, bipod, flashlight, 3 magazines and Optima 3-12x44AOE scope.